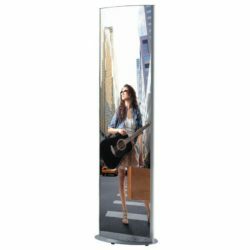 Packing Size: 30.91" x 80.71" x 3.35" / 14.57" x 30.12" x 1.57"
Totem poster stands are free standing poster displays that directly interact with customers by taking pride of place in any commercial setting. 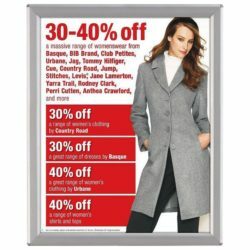 Poster stands encompass a bold, conspicuous presentation style that prevents patrons from needing to search endlessly to access the required information. Totem poster stands create a distant, eye-catching floor display that will grab the attention of all customers and deliver a flawless professional aesthetic. 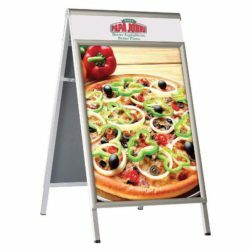 To maximize visibility, the sign holder has been manufactured as illuminated and double sided unit for graphics of 27″w x 77″h. 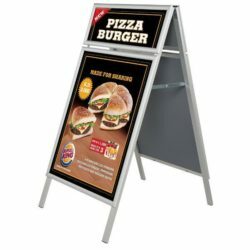 While the free standing poster display is easily accessible to customers and forms an interactive part of the commercial setting within which it is placed, the durability of the frame, and consideration to protection of the advertising content it holds, has not been compromised. 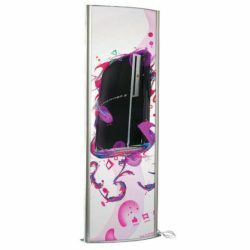 All images and promotional graphics inserted into the totem poster stands are shielded by a full length, clear, anti-glare PET poster protector. 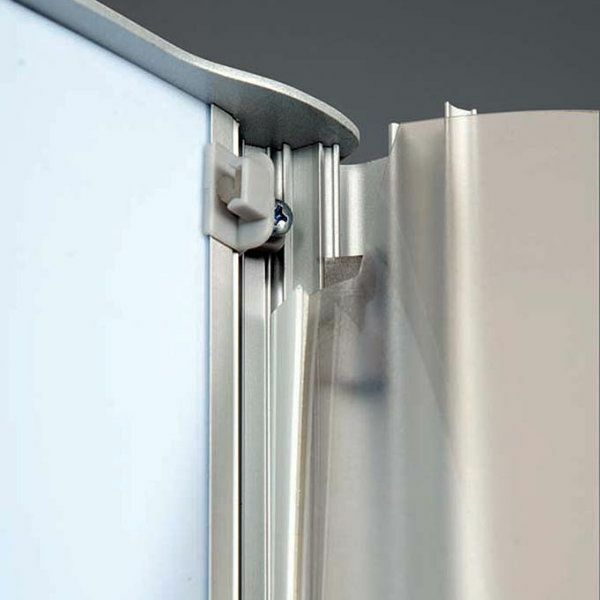 This poster protector is supported by magnets along the long side close over the graphic inside the stand. 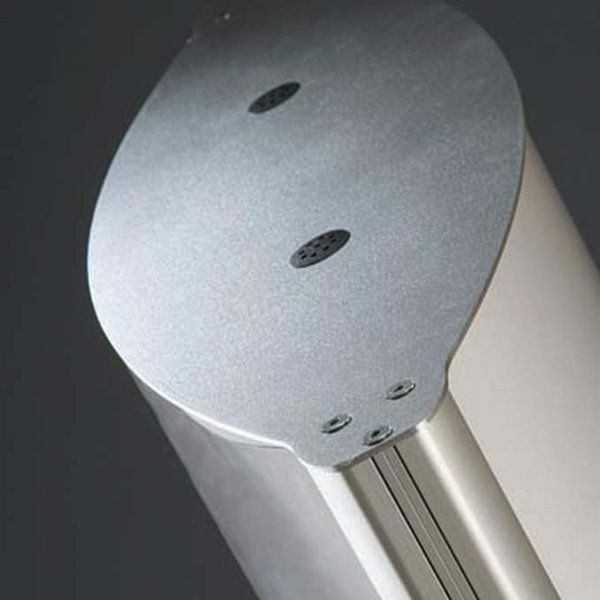 Safe use of the totem poster stand is guaranteed with all sign holders being constructed to feature ventilation holes in support of the 6.5 ft (2 m) electrical cable supplied. All units are delivered with certificates verifying that each floor display has passed CE/UL Pat testing. Furthermore, durability of the stand display is conferred by the stiff, opaque acrylic sheet defining the very structure of the frame. The opaque acrylic sheet is positioned within the inner grooves of the stand display, ultimately creating a curbed backing to the totem poster stand. Unlike traditional poster displays, the totem poster stand is a convex curved sign holder that presents a contemporary aesthetic for all advertising materials, adding a touch of style and professionalism to any marketing display. 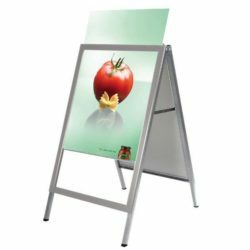 Totem poster stands have been designed as snap frames, meaning that the speciality design function of the free standing poster display enables graphics to be removed and replaced with ease. 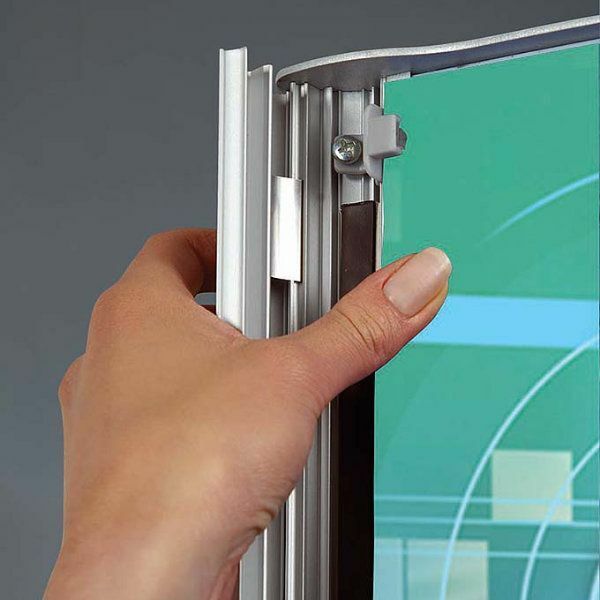 The snap lock capacity of the totem poster stand allows a quick rotation of advertising content – the combination of a hinged rail bar and magnetic cover that locks into place through the support of a series of plastic pegs offers the simplest and most practical operation for any free standing poster display. All of these features once again add structural stability to the sign holder, ultimately offering a durable, high quality product. 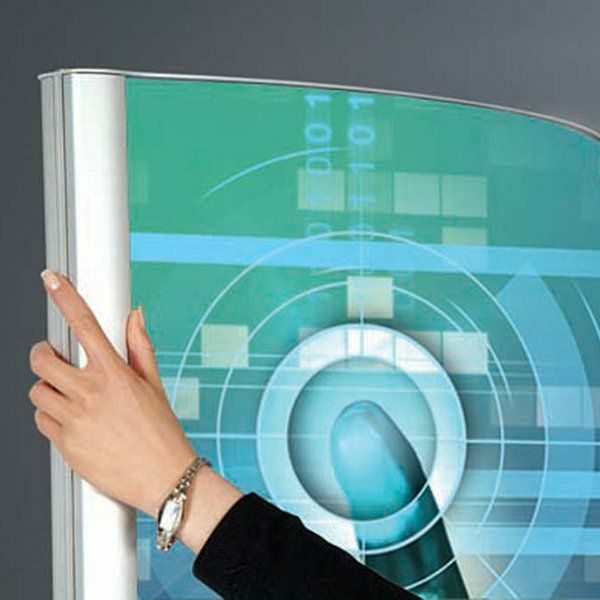 Altering the internal graphics of the free standing poster display really could not be easier. 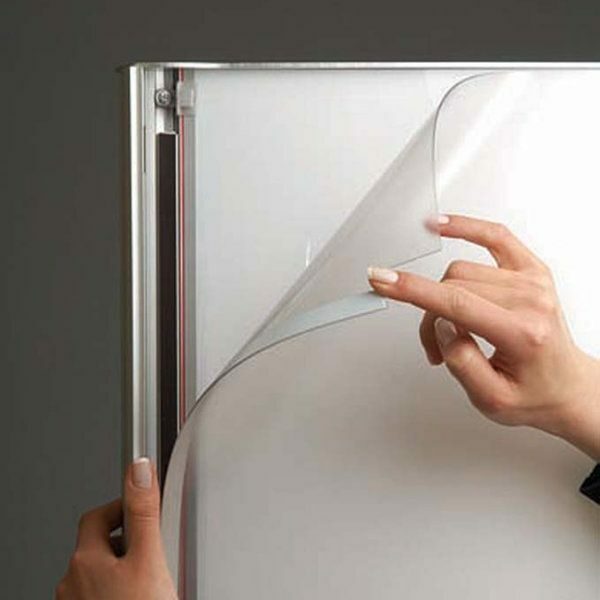 Simply, open one side of the frame by gently separating the magnetic adhesion edge of the anti-glare cover and peel back the clear protector sheet. 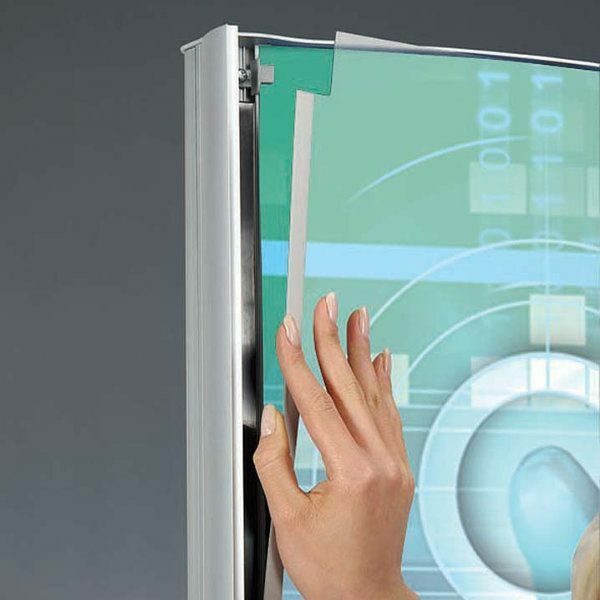 After the lens has been folded back, there are two clamps that will assist the user to hold the sign in place while the old graphics are removed and the new images are inserted. Once the new graphics are in place, use the magnetic cover to secure the pictures in place and flip the snap rail closed. 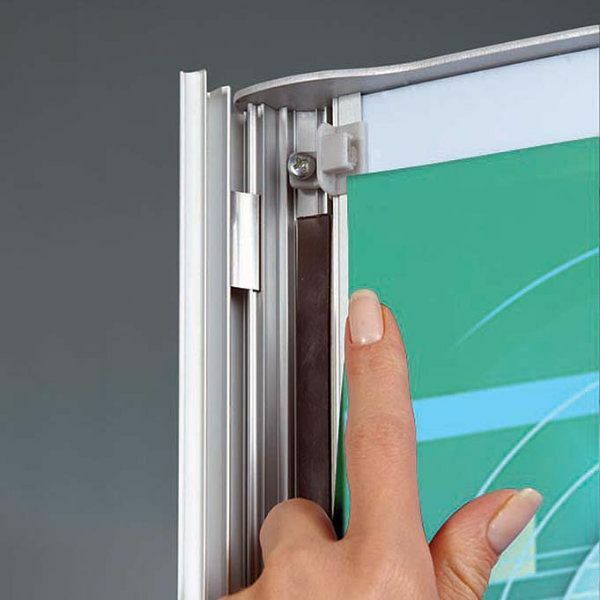 Ease of use of the snap frame is a much prided feature of this product. 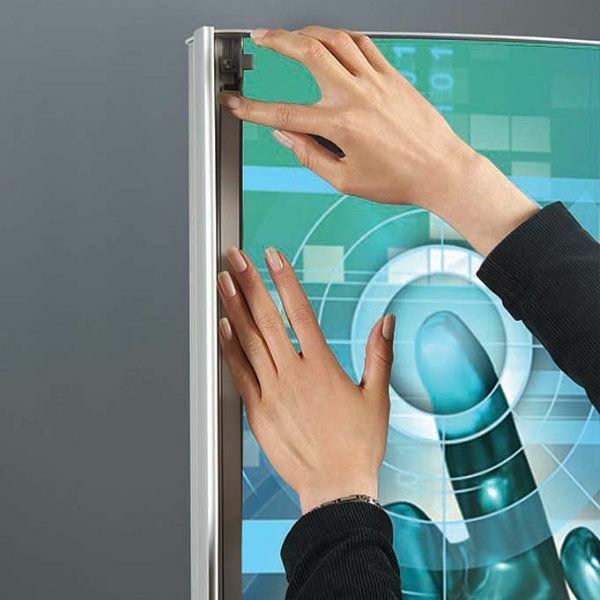 To ensue assembly of the stand display and rotation of images presents no complication to users, each floor display is packed with a step by step instruction sheet.